The young team led the way this afternoon as Jack Aitchison and Armstrong Oko Flex scored doubles in a 4-1 Reserve League win over Falkirk at Cappielow. Scott Allan, Marvin Compper and Dorus de Vries made their first reserve appearances of the season with January signing Vakoun Bayo given a debut but it was the younger element that impressed with Stephen Welsh, Daniel Church and Kerr McInroy putting in their usual strong performances. Bayo was given an hour, found himself in a few promising positions but has a bit of work to go before he can be pitched into first team action. 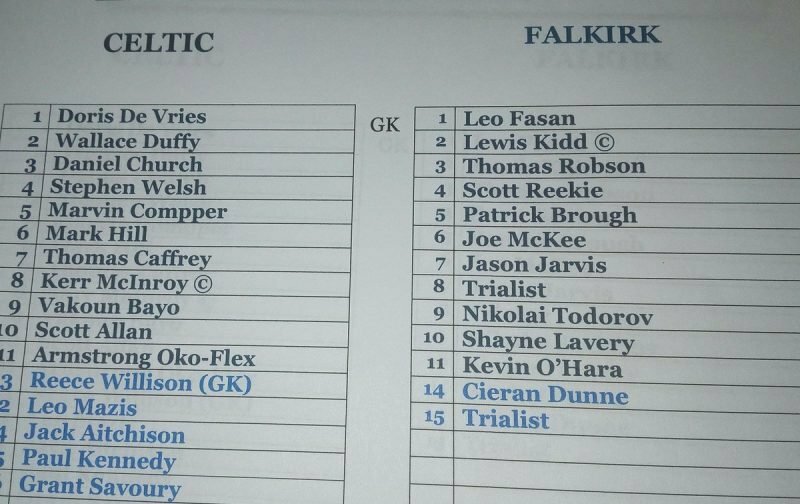 Mark Hill and Bayo had early shots blocked by Leo Fasan but after 18 minutes Falkirk took the lead. A cross from the left found Shayne Lavery unmaked 15 yards from goal, the striker turned quickly and sent a low shot beyond De Vries. That goal was against the run of play but it wasn’t until the last 15 minutes of the half that Celtic began to impose themselves with Aitchison replacing Wallace Duffy who was stretchered off after 25 minutes. In the 40th minute a driving run from Kerr McInroy set up a chance for Aitchison but he shot over from 15 yards. A couple of minutes later another run from McInroy ended with his shot being parried by Fasan with Aitchison squeezing the rebound over the line. It was all out attack now on the Falkirk goal, just before the hour Aitchison found space just inside the box then shot home to put Celtic 3-1 ahead. Soon afterwards Leo Mazis replaced Bayo. With 20 minutes left to play Aitchison was pulled down in the box but under instruction from the bench Oko-Flex stepped up to slot the ball home from 12 yards out.